Let’s have a quick overview of another book related to Modern C++ and The Standard Library. This time I picked Rainer Grimm’s book the author of the modernescpp blog. The book is available at LeanPub: here’s the link. 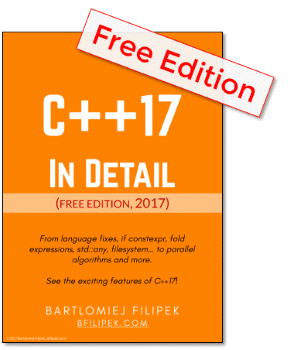 This book comes from the German version (amazon.de link), it was translated into English and then updated with the information about C++14. Later, in the second version of the book, we have descriptions of C++17 features. In the newest edition you can expect all info about significant STL C++17 changes like string_view, parallel algorithms, std::filesystem, std::any, std::optional and more. The book is a concise overview of the features, with lots of examples. And as I know from the author it was not an easy task to fit all vital information in around 200 pages. One note, this book comes as an ebook, but there’s a Korean translation that appeared as a printed version. History and an overview of the Library. Where we are in the standardization process. Everything you need to start with STL: pairs and tuples, chrono, smart pointers, type traits and C++17 utils: any, optional and variant. Common functionalities of sequential and associative containers: creation, deletion, size and access. Basics about arrays, vectors, deques, lists and forward lists. Information about ordered associative containers (like std::map or std::set) and then unordered (hash maps in the form of std::unordered_map or std::unordered_set). Stacks Queues and Priority Queues. Iterator intro, categories, how to use them. Function objects, functions and lambdas. A quick overview of all useful algorithms: from for_each to sorting, min max, permutations and hashing. How to create and use strings in C++: concatenation, element access, comparisons, searching numeric conversions. A short chapter about new, non-owning string object - that was introduced in C++17. When they can help and how to use them with the relation to regular strings. Regular expressions in the STL were introduced with C++11. This chapter contains a short overview. Jump start into multithreading (core parts introduced in C++11): memory model, atomics, threads, shared variables, condition variables and tasks. doesn’t look as polished as larger books from standard publishers. Rainer Grimm’s book is a great way to learn basics of STL, including major changes of C++17. The book is easy to read. It can serve as a quick reference or as an overview of the Standard Library. It might be handy if you just finished some intro book about the language and you look for another step. I’m also a big fan of self-publishing and Rainer is a great example that you can succeed in such approach. Also if you look for more about multithreading Rainer has another book solely on that topic. Check it out here: Concurrency with Modern… by Rainer Grimm. The giveaway has ended. Thanks for all your entries and comments! Together with the author - Rainer Grimm - we’d like to offer you 5 (five!) bundles of the books. What are your main blockades when learning C++? What are the areas of C++ you’d like (or need) to learn next?